An article doing the rounds on my Facebook feed claims that African immigrants are the most successful group in the United States when it comes to academic achievement. African-born immigrants are more likely to be college educated than any other immigrant group, it says. Their claim notes the source as "Census Bureau data by the Journal of Blacks in higher education", which I couldn't find a more specific resource for. Are these statements otherwise verified? I can imagine African immigrants having the highest immigration demands of any group, but the statements still seem counter-intuitive considering funding issues for academia in large parts of Africa. The article you linked correctly restates the conclusions of an article published in the "news and views" section of a scientific journal. I am unable to tell if their conclusions are rigorously true, or simply due to how they chose to interpret the data. I am unable to find their original data source. The original source of this claim comes from an article titled, African Immigrants in the United States are the Nation's Most Highly Educated Group, published in The Journal of Blacks in Higher Education. Unfortunately, this article is behind a paywall. 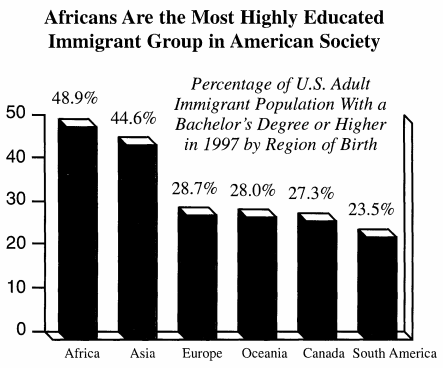 The authors provide the following chart that shows that a higher percentage of African immigrants have a bachelors degree, than any of the other groups they examined. They provide a similar chart for graduate degrees. Both charts support the claim. They cite the "US Census Bureau" as their source. That is very unhelpful. The most recent census when this article was published was the 1990 census. The article is about 2 pages long, and does little other than restate the census data. This google scholar search seems to suggest that it came from the "News and Views" section of the journal rather than the serious scientific section of the journal. Conclusion Although the claim is consistent with my personal experience and common sense, I cannot tell if any rigorous data supports their conclusion. If this study is based on rigorous data, that data is at least 20 years old. Hopefully my answer will be helpful to someone who can give you a better answer. Not the answer you're looking for? Browse other questions tagged immigration africa .